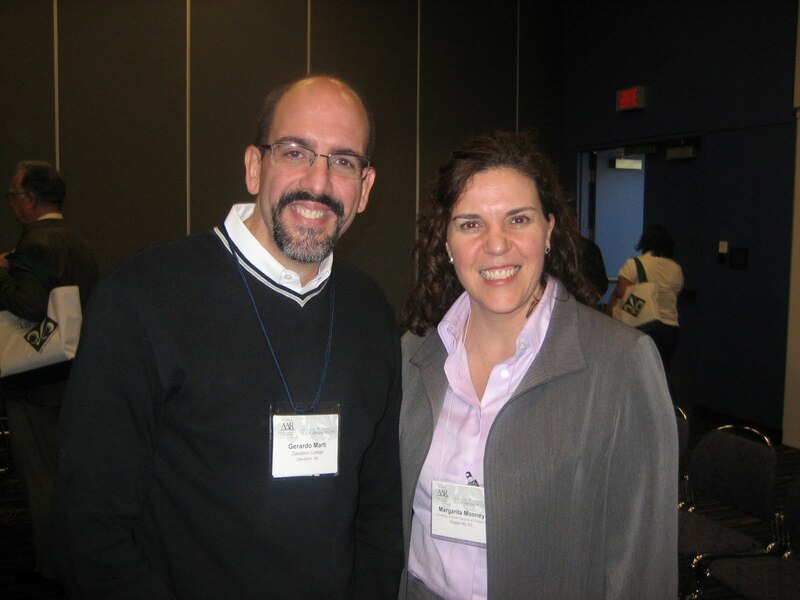 Gerardo Marti, Associate Professor of Sociology at Davidson College (pictured here with me), said he thinks my book’s greatest contribution is the cross-national comparative research design, which allows me to highlight the importance of the nation-state’s relationships to immigrant communities. Although much work has been done on immigrant religious communities in the U.S., my work highlights how different national contexts contribute to shaping the institutions which immigrants rely on succeed in their new societies. I agree with Gerardo that most scholars in the U.S. find the cross-national comparative research design to be the greatest strength of my book. However, visiting Quebec for the AAR reminded me that the national context also influences what readers think my book’s most important contribution will be. In the last 40 years, Quebec has become one of the most secular societies in the world. Many intellectuals and members of the general public in Quebec tend to look upon religious piety as an escape from worldly probelms and they generally view religious institutions as oppressive. Hence, in Quebec, my book may be most cited for demonstrating how religous faith can give people agency and how religious institutions can empower the poor. In Quebec, it is generally known that the American people are generally pro-religious and the American government works extensively with faith-based and other types of private associations in delivering social services. If Americans sometimes forget that our national context is generally pro-religious, then the parallel is that Quebeckers sometimes forget that religion can be liberating and that their state does not perfectly meet all social needs.